During the summer months, berries are in bloom and ready to be picked. If you happen to have a couple of bushes in your garden, you could end up with more bounty than what you can eat at one time. Raspberries in particular, do not have a long life. Once picked, they need to be eaten up within a couple of days. Raspberries are available at several farmers markets and are available from early to late summer. Unlike some berries that lose some of their flavor when cooked, raspberries retain their sweet-tart flavor. Make raspberry muffins with your bounty. These are easy to make and only require a handful of ingredients. All you need is eggs, flour, raspberries, baking powder, butter, sugar, and milk. These take only 20 minutes to bake and are a great breakfast treat or late night snack… and it will help you to use up those raspberries before they go bad. When you are making up some batter for a pancake breakfast, add some of those fresh raspberries to the batter. You may want to add a little sugar to the batter to take away a little of their tartness. Serve your family some fresh raspberry pancakes to use your bounty up. Fresh raspberry jam is a treat that you can look forward to during those winter months. Raspberry jam is a great way to use up those berries from your own yard or purchase some from the pick your own farms or farmers markets. All it takes to make raspberry jam is pectin, sugar, and, of course, the raspberries. If you happen to eat ice cream during the summer months, then use up those fresh raspberries. Just pop them into a blender or food processor to puree them, add a little sugar, and let it set overnight in your refrigerator to blend the flavors. The next day, use the raspberry puree to top that dish of ice cream. Another thing that you can make is raspberry flavored vinegar. All you need to do is puree the freshly picked raspberries and add it to white wine vinegar. Store it in a glass jar and let it sit for two weeks. This vinegar will add flavor to salad dishes and can be stored for a long time with no decrease in flavor. Raspberries are a wonderful summer fruit that are rich in anti-oxidants. They are also low in calories and are rich in dietary fiber. Raspberries are also an excellent source of vitamin C and help to counter inflammation, and develop resistance to diseases. They are rich in vitamin B and K as help to break doen protein, fats, as well as carbohydrates that we ingest on a daily basis. 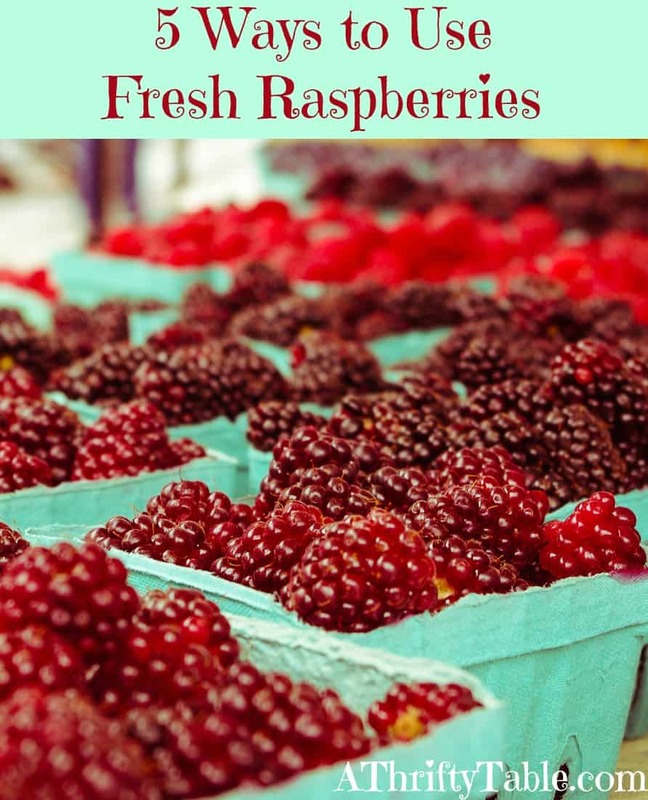 The above 5 ways to use up fresh raspberries will help you to know what you can do to use them up and also help promote your body with important nutrients and vitamins. To make your berries last a little longer, fill a bowl with 1 part vinegar to 5 parts water. Soak the berries and then dry them on a paper towel. I've been able to keep fresh raspberries on hand this way for two weeks and it works for all berries!